With solar panels producing electricity, you generate your own power and reduce or even eliminate your monthly utility bill! Solar electricity, also known as photovoltaic, or PV for short, is a fast-growing industry and utilizes the greatest and cheapest source of renewable energy — the sun! Putting PV panels on your home turns the sun’s light into energy, generating power for your household. This drastically decreases or even eliminates your electric bill. Wouldn’t it be nice to run your air conditioner during the summer without dreading the cost? Solaron is proud to be an Authorized Dealer for SunPower. Compared to other solar panels, SunPower converts the greatest percentage of sunlight into electricity. SunPower solar panels deliver up to 44% more power per square foot than conventional panels. That means you get more power for the same amount of roof space, maximizing your electrical output and potential utility cost savings. SunPower controls the entire manufacturing process of their product, producing the high quality, good looking solar panels. 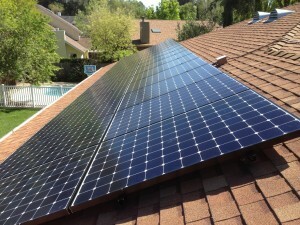 SunPower panels come with a 25-year performance warranty, an industry-leading guarantee. Solaron installs SunPower panels because we believe they are the best on the market and our past customer satisfaction proves it. Great products installed by a reliable company — that’s a winning combination!